For our first release of 2019, we are launching an update to the Business Profile that makes it possible to display the customers that can serve as your client’s references. With Customer References your clients can easily show their customer references to lenders or others who receive the company’s business. These references may have positive stories they can share about your client’s products or services. 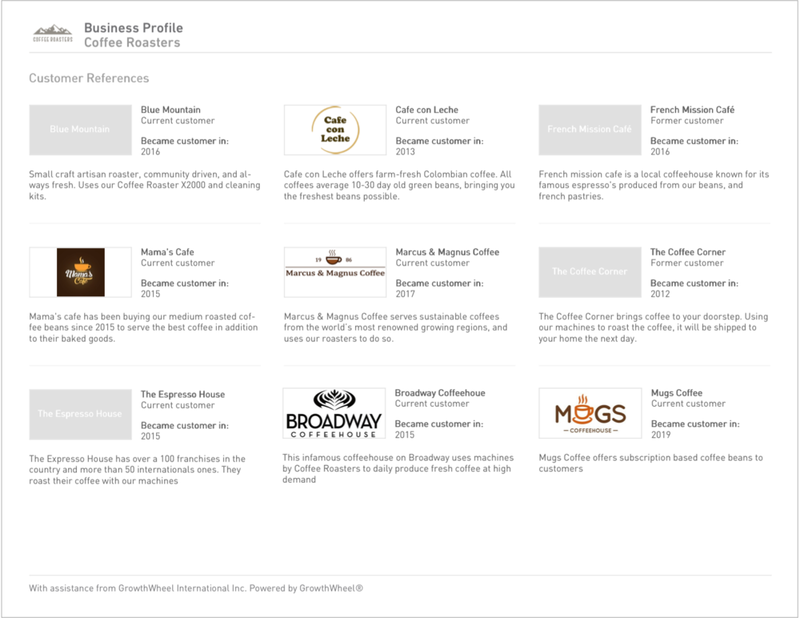 This feature will be available in the new menu “Customer References” and allows you and your clients to add more detailed information about your client’s customers — in addition to the market and customer segment in the Business Profile. Add all the details about each of your client’s customers, such as name, status, description, and the year the customer was acquired. You can also upload an image or the customer’s logo. Get a visual overview of your client’s customer references by downloading them as PDF file. Now you can easily print or share the references with other stakeholders. You and your client can view or edit all customer references on GrowthWheel Online in the new menu.